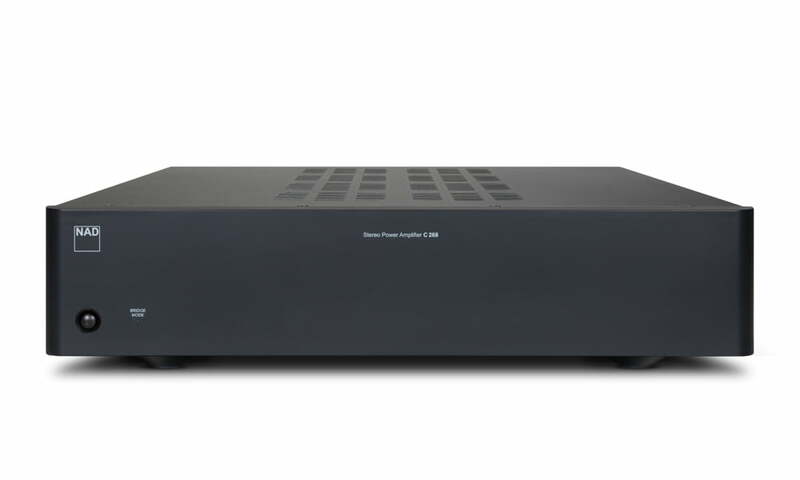 Press Release (ePRNews.com) - DENVER - Oct 05, 2017 - NAD Electronics, a leading manufacturer of premium home audio and video products, introduced the C 268, a new affordable stereo amplifier designed for multiple applications. Among some of the most common uses, the C 268 can be used in a traditional setup with a preamplifier, for bi-amping loudspeakers or as a slave amp. The new NAD powerhouse is even bridgeable, transforming its ample output from 80 X 2 to a remarkable 300 watts. The C 268 has a U.S. MSRP of $799 and will be shipping this month. NAD designers have shunned conventional power-hungry linear power supplies and Class AB output stages that waste nearly half of the energy consumed producing heat rather than sound. Instead, they have developed even better-performing circuits based on switch mode power supplies and Class D output stages. Once thought to be inferior to traditional topologies, NAD’s advanced engineering in this area has created some of the best performing amplifiers regardless of basic design principle. These new designs are very linear over a wide bandwidth, providing dramatic advances over previous models and with consistent performance into all speaker loads. The power supply of the C 268 is capable of nearly 200 watts continuously and over 500 watts instantaneously to allow for short-term musical transients. Innovative Asymmetrical PowerDrive fully utilizes every watt available with its vast reserves of dynamic power available to accurately reproduce musical transients without distortion or compression. It can operate with any AC mains voltage from 100V to 240V and provides pure DC power to all the various stages of the C 268. This highly efficient supply also provides near perfect regulation of voltage across a wide range of conditions and provides a solid noise-free foundation for the amplifying stages. For over forty years, NAD has developed a worldwide reputation for great-sounding, best-in-class amplifiers and the C 268 is certainly no exception. Even at an affordable price, this amp provides advanced technology and a rich feature set that allows the user to benefit from the C 268 in a variety of applications from basic stereo amp to a powerful monoblock. The C 268 uses a customized version of the proven Hypex UcD output stage. This allows for massive power output with nearly unmeasurable distortion and noise in the audible range. Every detail of this design has been carefully crafted and perfectly executed to wring out every last drop of performance. The C 268 may be a basic Power Amp but NAD has carefully thought through all the possible applications typically encountered to create a rich feature content. Selectable balanced inputs make the C 268 a natural for studio use or connection to High-End Preamps and Processors. These inputs include a trim control useful for matching to other components or for use in Bi-amping Speakers. A line out allows further addition of power on the same channel for additional speakers or subwoofers. Added to all this connectivity is a Bridge Switch that turns the C 268 into an amazingly powerful Monoblock Amplifier. Start with one and add a second C 268 later when you upgrade your speakers. Alternatively, the C 268 can be paired with the company’s NAD C 368 Integrated DAC Amp, and with both units bridged for Mono, 300 distortion-free watts per channel are available for pure listening pleasure. Auto-sense with selectable threshold is perfect for automating complex systems or hiding the amp out of sight in a cabinet. NAD has included a Ground Lug that can be useful for eliminating ground loops and noise in complex multi-unit systems. NAD will be exhibiting at the RMAF in Denver, Colorado Oct. 6-8. Along with sister brands PSB and Bluesound, NAD can be found in Room 8021 in the Tower and in A03 of the Atrium section of CanJam. Founded in 1972 and now sold in over 80 countries, NAD Electronics is renowned for its award-winning line of high-quality components for audio, home theatre and custom installation applications. Since the beginning, NAD’s commitment to four core values – innovation, innovation, simplicity, performance, and value – have earned it a cult-like following that catapulted it to becoming a household name amongst audiophiles and music lovers alike. To this day, the brand continues to design and manufacture some of the most acclaimed and affordable hi-fi components that include modern features and technologies meant to appeal to a new generation of audiophiles. For more information visit www.nadelectronics.com.